It is Stephanie's party and I am bringing some mushroom gratinate. It is one of those recipes that remind you of something else but yet you keep making it for its amazing taste. Could it be because it is Lidia Bastianich's recipe? 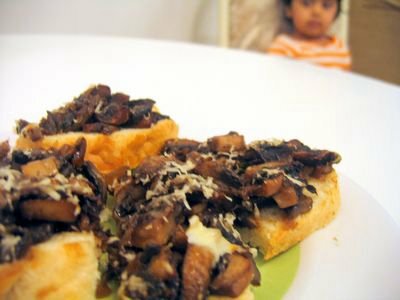 It seems like a crostini with mushroom topping. But the longer baking time and lots of pressing makes it more like a mushroom pizza. I just used some button mushrooms. The best part is our 18 month old loved the topping (she does not like anything usually). Here are the mushroom fingers (as I like to call them) and my gal hanging around for the party to begin-). Heat the olive oil in the skillet over medium heat and sauté the garlic, stirring, until it just begins to color. Add the butter and, when it melts, toss in the mushrooms, sprinkle on the thyme, sage, and salt, and cook, stirring now and then, until the water evaporates and the mushrooms start to caramelize. Remove from the heat, then stir in the grated cheese. Lay the bread slices in one layer in the baking pan to cover the bottom completely. 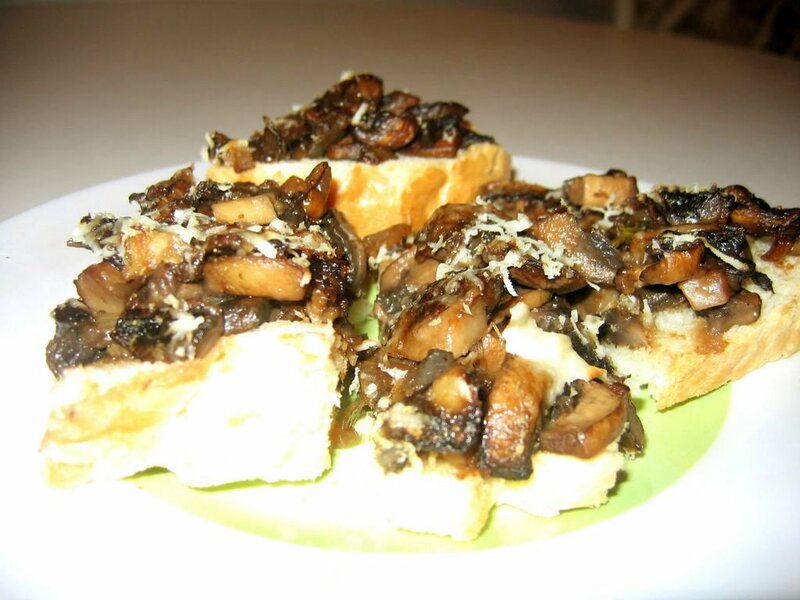 Spread the soft butter all over the bread and spoon the mushrooms evenly on top, pressing them down into the bread. Sprinkle the parsley on and top with grated cheese. Bake for 10 to 15 minutes until the cheese has browned and the edges of the bread are crisp. Let rest a few minutes, then cut into serving pieces. Makes 12 pieces. I can never get myself interested in cocktails or mocktails. I leave it to friends to supply them. So this recipe for pomegranate martini comes from my friend S who loves making cocktails. I think the color of it would be beautiful and festive. Shake together 3 oz citrus-infused vodka and 3 oz of POM juice with some ice. Shake,shake, shake and pour into chilled glasses. Serves two. Mika, your mushroom fingers look amazing! Thanks so much for coming to the party...and by the way, I adore POM juice. Yum. And I love you for being so early!!! I think Vijay is going to like this recipe. I am going to try it, Mika. Your daughter looks beautiful,Mika. I like her eyes. I always wanted to ask you her name. Thanks Stephanie for your nice comments. I had fun participating in your blog party. Hi Indira, thanks for your kind words on both the post and my daughter, Aditi. She was eyeing the slices greedily, when I took the photo. The recipe can be very much reduced to just two or three slices of bread and few mushrooms. Let me know how it turns out. Aditi, what a wonderful name. I like it. Give her some kisses for me. Hi Mika, It would've be been great if the photo of lil Aditi had been clearer :) She's cute! OOh...those looks delicious! I have to try it soon. And hello, little Aditi! I love your name. Little Aditi has such good taste as these look delish. I love mushrooms in any form so this will be excellent.